Buena localización. La animación muy pobre y de poca calidad. La comida poca variedad y en términos generales mala. This delightful apartment hotel lies between Salou and Cambrils. Guests will find themselves just a few steps away from the beach, as well as an abundance of shops and entertainment venues. 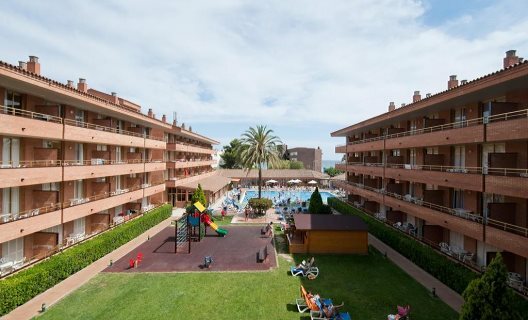 The complex is situated just a short distance away from the train station in Cambrils. This charming complex greets guests with the promise of a truly enjoyable stay. The apartments offer a refreshing home away from home, and come complete with modern amenities for added comfort and convenience. The complex provides a wide range of excellent facilities and services, meeting the needs of every member of the family. Type: Hotel, Hotels With Charm, Beach Hotels. Aqua fit, Table tennis, Aerobics, Billiards. Services: Breakfast buffet, Buffet lunch, Buffet dinner. Room size (sqm): 40, Free WiFi.